Pictured above: Rachel’s former therapy animal partners, Byron and Mia on vacation from their therapy dog work! Coach is an 9 year old rescued basset hound, whom I adopted when he was six months old. He is a "clown" and very sweet and silly; his demeanor and happy-go-lucky attitude make people smile and laugh. He is such a character! He is incredibly sensitive, sweet and social - a real extrovert! He enjoys working with populations ranging from children to seniors. He has been a "Reading with Rover" dog and has experience working in clinical, hospice, and school-based settings. Moose is a 4 year old, nearly-20 lb Flemish Giant rabbit! 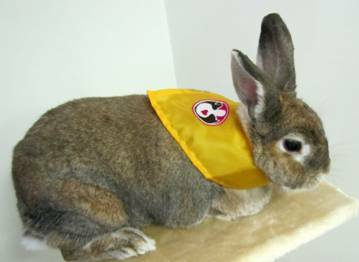 He is very sweet, curious, social and silly, He and I are currently working together on our certification as a therapy animal team through "Bunnies in Baskets" (therapy rabbit organization based out of Portland, OR). His "big" sister, Clover, mentored him immensely on what it means to be a therapy rabbit. Clover was a 10 year old rescued American-mix rabbit, whom I adopted from Seattle Humane Society when she was one year old. She retired from working in 2015, due to aging and associated physical health changes which included becoming disabled with IVDD and arthritis in her back legs. Over the course of 1.5 years. with amazing grace, dignity and strength, Clover navigated her disability, Lymphoma diagnosis and treatment, and a chronic tooth abscess. She continued to surprise, inspire and teach her veterinary care team on a regular basis! Clover was an incredibly confident, calm, relaxed diva-bunny. She worked with a large range of populations (children to seniors) within clinical and pediatric settings as well as assisted-living facilities. People were always quite smitten with her and loved to pet her very soft fur; and she absolutely adored having her head and cheeks massaged and devour blueberries! Clover was a wonderful mentor and coach for her "little" brother, Moose - teaching him what it means to be a therapy rabbit. Countless times over the years, people would comment to me that meeting Clover inspired them to adopt a rabbit themselves! Indeed, Clover certainly taught so many people about rabbits! As Clover’s chronic and terminal health conditions progressed, I provided extensive caregiving for her, providing palliative and at-home hospice care. On July 23, 2017, Clover passed away peacefully in the most beautiful and dignified way - in my arms and at home with her family. Clover was an absolutely beautiful spirit and taught me so much about having grace and calm perseverance, especially when faced with and in spite of so many challenges. She is the one who inspired me to support and advocate for others in the area of animal hospice and palliative care (especially with other exotic animal species). She continues to be my inspiration…and I know she touched so many profoundly. Mia, was a rescued "Bassador" (Basset-Labrador mix), whom I adopted when she was one year old from Washington Basset Rescue. She was a truly unique and wise old soul. She worked with so many different clients, in a variety of settings including: clinical and school-based counseling, hospice, hospitals, nursing homes and assisted living facilities. It is impossible to say how many people she profoundly impacted throughout her life. She worked many special events and served as a representative of the Therapy Animal Program when I worked at Pet Partners International Headquarters. Mia was also frequently my co-facilitator and co-presenter when conducting workshops and presentations. Her specialty was providing animal-assisted therapy to adolescent girls with co-occurring issues. Mia always had an innate way of knowing who needed attention at any given moment, and for making people laugh by balancing "serious" with "silly". Her rescue story combined with her unique appearance helped people to accept differences in others and embrace their own uniqueness. My favorite thing said numerous times about Mia on her pediatric hospital therapy visits was: "I wish I had some Mia ears of my own that I could pull out to stroke when I feel sad or lonely.” (I must admit Mia's ears did feel like the softest most luxurious velvet.) After working as a Pet Partners therapy dog for 10 years, Mia retired at the age of 12 years old. She was a Lymphoma survivor of nearly 3 years (in which she had 3 remissions) - she was truly a medical miracle - surprising and inspiring her primary veterinarian and oncologist! During this time frame, I provided extensive palliative care to Mia and collaborated with many veterinary professionals as we navigated the long-term “cancer roller-coaster ride”. After her Lymphoma diagnosis, Mia focused on spending her working time providing animal-assisted interventions to people who were also fighting cancer and other terminal illnesses. Being her mom and engaging in these precious moments was incredibly profound and inspirational - more than I could ever fully describe in words. On November 4, 2014, Mia decided she was ready to let go and passed away - on her own - on her terms - in my arms, with her dad and canine brothers present. Mia was the one who taught me immensely about pet bereavement and inspired me to pursue veterinary social work as a specialty. The lessons she taught me became my “Why” as a veterinary social worker, thereby going on to provide social work services to Summit Veterinary Referral Center, the same hospital, that cared for her throughout her disease process. Mia continues to be my inspiration on a daily basis. Byron is a 16.5 year old rescued flat-coated retriever, whom I adopted when he was four months old from Tacoma Humane Society. He is friendly, bouncy and a very affectionate young soul. He is absolutely amazing at 16.5 years young! He was my first therapy dog partner and taught me immensely about the importance of teamwork, always being your animal's best advocate, and intentionally listening to your animal when they decide they are ‘done’ doing this work. Byron's specialty was working with adolescent males in the clinical setting, and with adult and senior male clients with life-threatening and terminal diseases in the hospice setting. In October 2017, Byron was diagnosed with Lymphoma. He completed his chemotherapy protocol and has been in remission for 14 months. He is also navigating other age-related chronic conditions, but is an inspiration in how he keeps his ‘young-at-heart’ attitude through it all. He enjoys being a "couch potato"', snuggling with his toy duck “Daphne”, spending time at Farrell McWhirter Park, and looks forward to each and every single meal! 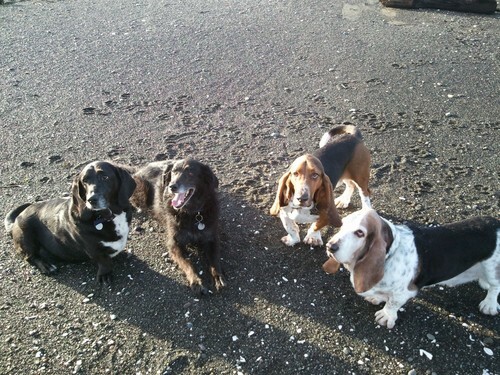 The original “Wright Pack” - (Left to Right): Mia, Byron, Coach and Rudy (Rudy was very clear that he did not want to be a therapy dog! ).